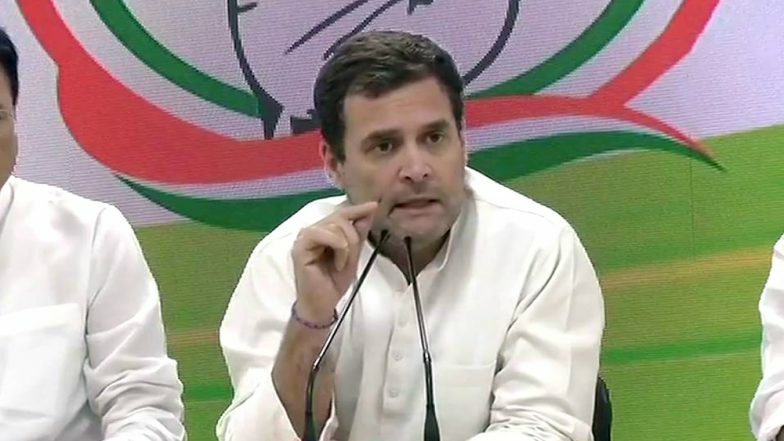 New Delhi, March 26: Congress President Rahul Gandhi's latest announcement to provide to Rs 72,000 per annum to 5 crore households, if implemented, is likely to have a major impact on the country's exchequer, costing a huge Rs 3.6 lakh crore per annum, according to economists. Under the 'Nyay' scheme, Gandhi said the Congress will provide Rs 72,000 per annum to 20 per cent poorest families in the country. The scheme will benefit 5 crore families and 25 crore individuals directly, he said. Rahul Gandhi Explains Congress' Minimum Income Guarantee Scheme, Promises 'Rs 72,000 Per Year to 20% Most Poor Families'. While the Congress chief initially said the "minimum income line" is Rs 12,000 per annum and the scheme will benefit individuals earning less than that, he subsequently clarified that the scheme will supplement the income of the poor if it is less than Rs 12,000 per month. In defence of the announced scheme, former Finance Minister and Congress leader P. Chidambaram said in a tweet: "We have consulted economists, this is doable, and we will adhere to fiscal discipline." "Every family in the poorest 20 per cent will be given an income support of Rs 6,000 a month," he said.